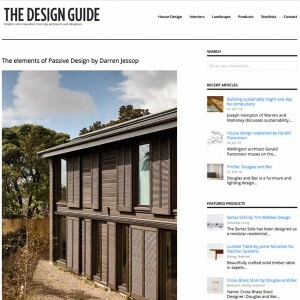 Architect Darren Jessop worked closely with the owners of this Auckland home to create the first certified Passive House in Australasia, meeting an exacting set of international standards. Our design for this four-bedroom home in east Auckland began typically enough. We had worked through three sketch design options with the client and had settled on one that met the budget and maximised the use of the long narrow site from a sun and space point of view. At this point, our Canadian-American client started asking deeper questions. He was particularly interested in specifications for heating and cooling and was disappointed with the low thermal insulation standards of New Zealand homes, plus the lack of guidelines for their design and performance. He began an extensive research journey to discover a suitable standard and technologies to support it. We needed to find one that we could adapt to our local construction methods that would also create the performance required. Our client opted for the internationally recognised Passive House model first developed in Germany in the 1980s. Research shows that energy consumption in Passive Houses is about 80% lower than in conventional buildings. They combine high-levels of comfort with low energy consumption using high thermal insulation and heat recovery systems. 1. Clever compact design that optimises the use of natural resources for comfort. 2. High insulation to ensure the house stays warm once heated and remains cool in summer. 3. No thermal bridging so that the inside of the house isn’t affected by the exterior conditions. 4. Air-tight construction for optimal control of the ventilation system. 5. Consistent air circulation for a continual supply of fresh air at perfect living temperatures. This was modelled at the design stage using software developed in Germany.